Wireless headphones with High-quality Sound：Latest Wireless Bluetooth 4.1 version with A2DP technology, Aukey best Bluetooth headsets provide a high quality stereo sound. Powerful audio driver offers balanced audio and crystal clear sounds with dynamic base performance. Noise canceling technology: Built in microphone with CVC6.0 noise cancellation technology, the stereo Bluetooth earphones let you get high quality, hands-free phone conversation with clear voice even in noisy environment like inside a gym and running/cycling on the road,no matter your phone is Iphone6 6 plus ,6s ,6S plus or other andriod devices. Long-time Enjoying: built-in 120mAh lithium-ion polymer battery, up to 8 hours of talk time or 160 hours of standby with a full charge; battery level indicator with iOS devices to keep track easily. Package Content: Aukey EP-B13 Sport Bluetooth Headphone, USB Charging cable, 4 x Earbuds, User manual, 24 month Worry-Free warranty and friendly customer support service. 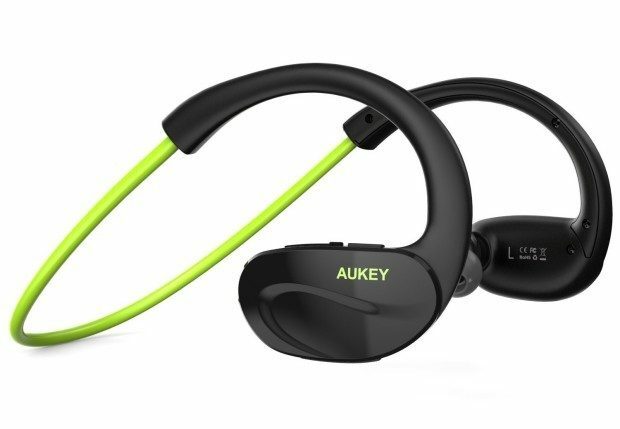 Bulit for comfort with Sport Style: whether you are off-road mountain biking, driving, walking or anything else – the Aukey wireless best Bluetooth headphones will retain a comfort fit within the ear canal (wireless in ear headphones). This is thanks to their ergonomic earbuds design and being super light-weight! Stylish sweatproof around-the-neck design headphone guarantee 100% stable and comfortable wearing experience for running, jogging, cycling, driving, camping, hiking Gym exercise and other outdoor sports.